After our day of research, we wandered back across the river, stopping at the train station to get a timetable for trains leaving for Belfast the following day. 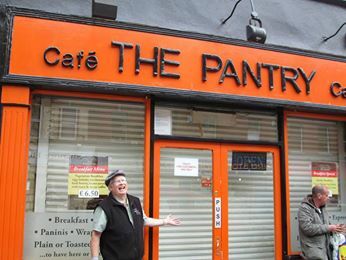 We also stumbled upon “The Pantry,” Dublin’s version of my dad’s breakfast place in Pueblo. He’s one of the “everyday” morning customers. Dad found his Dublin home away from home. We strolled along this street, and I found a shop that had inexpensive luggage, as the straps on my new (bought for the trip) backpack were falling apart, and I needed a replacement. We got a few other souvenirs, and eventually, we headed back to the hotel to pack for the next part of the trip. The next day, all packed and ready for the next leg of the trip, we headed to the bus station. The trip from Belfast to Dublin, well, I posted that last week. After our neighbors got off, the trip was not nearly as interesting. I got caught up on journal entries at least. 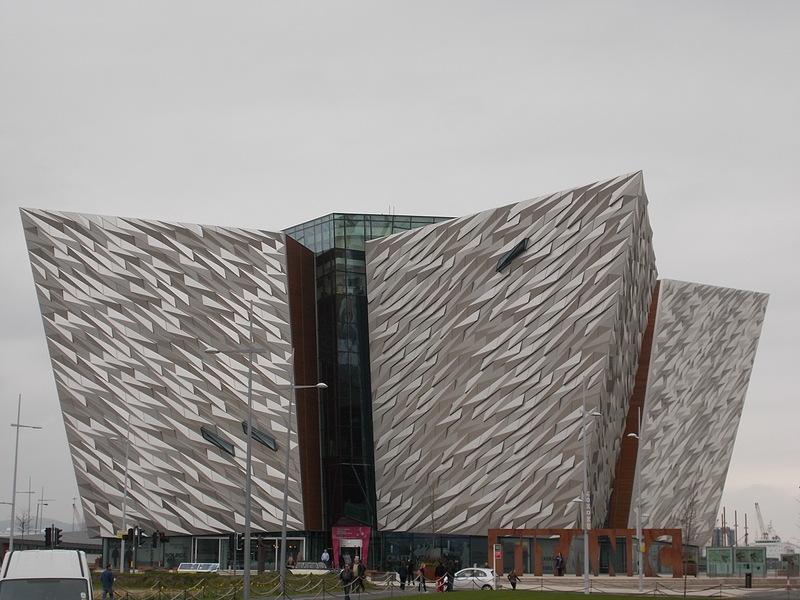 Once in Belfast, we took a connecting train to the city center (our hotel was a block away from the City Hall), and headed to the hotel. After stowing the luggage, we were ready for our now traditional “get a feel for the city walk-a-bout.” Plus, my sister and I needed to get us some local currency, so, finding an ATM was of some importance. Armed with a local map and some general orientation tips from the front desk, we headed first toward City Hall, where we checked “get local currency” off the list. 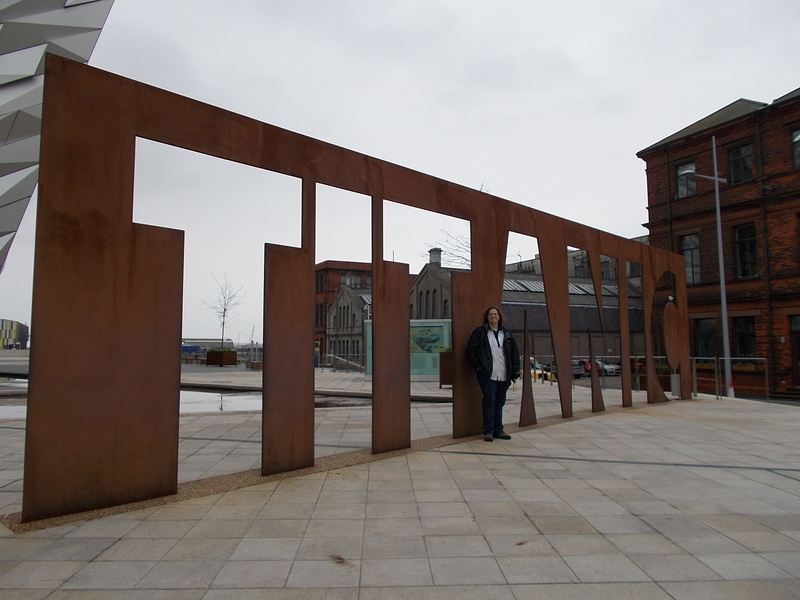 My sister, who has been a titanic Titanic fan since long before there was a movie, wanted to head towards the Titanic Quarter. She was doing the navigation for us this day, and we meandered in the general direction of the famous shipyards of Belfast were located. We walked along the river, and we walked, and we walked, and while we were clearly getting closer, we soon realized we’d taken the long way. Having finally gotten there, we decided we might as well go in and tour the museum. 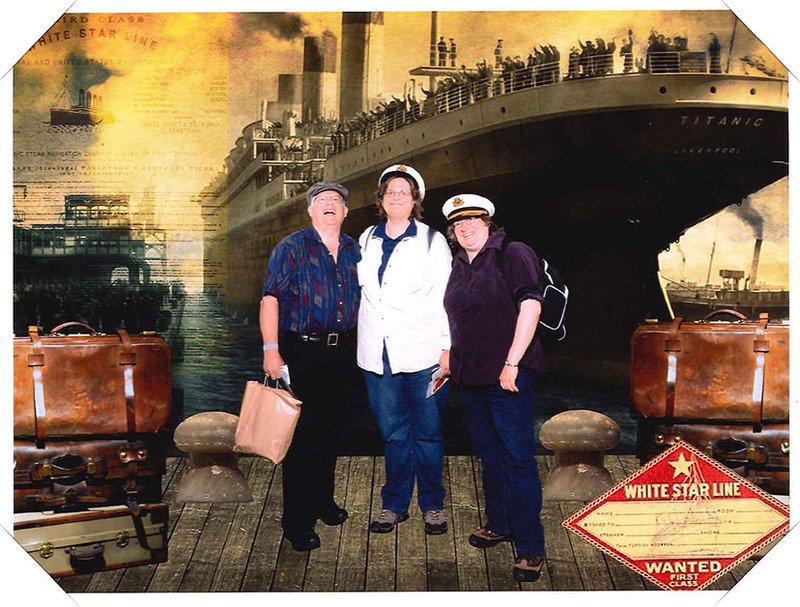 The Titanic Experience. the height of the walls is the same as the height of the Titanic. It’s a pretty elaborate museum. They’ve got some impressive interactive 3D animations that simulate walking through the ship, and a ride that takes you through the building process, how the teams of riveters did their part, and there are all the ship’s plans, which you can zoom into. Belfast is rightly proud of its ship building, and of the flax industry which lead to linens and rope-making, and the growth of the city. One of the few pictures of all three of us came from here. Yes, it’s a novelty picture that they were happy to sell us. It becomes clear why the ship sunk. The crew looks like this is their first sea voyage. 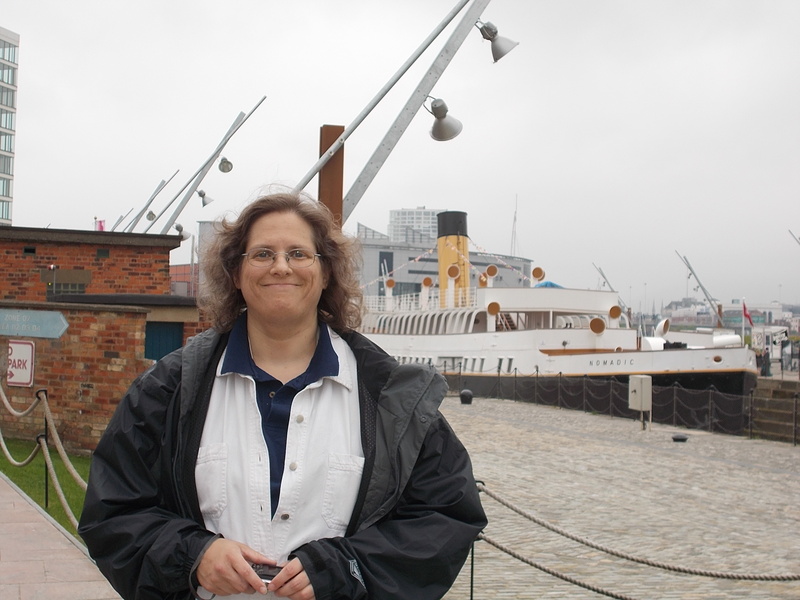 My sister, having come this far, was not going back until she’d seen the berths where Olympic and Titanic sat during construction (which is really a big empty bunch of nothing), and the pump house where something got pumped, and the Harland and Wolf office building. I admit, I’m not quite the fan she is, and by this point, we’d been walking for a long time and I was pretty cranky about being on my feet, especially to see stuff that wasn’t even there any more. The only thing that keep me going, if I’m being really honest, was that my sister was so very clearly pleased to be there. My sister in front of the cut metal “Titanic” sign in front of the museum. The brown building to the right was the offices of Harland and Wolf. She is not the only one who is captivated by the tragic story of the mighty ship and its maiden voyage. As much as I’ve absorbed of the players in the tale over the years hovering around my sister, I still learned a decent bit. One of the things I didn’t know was that Ernest Shackleford was one of the expert witnesses who testified at the inquiries into the tragedy. He stated, unequivocally, that the sinking was the fault of Captain Smith, who was going way too fast for waters where ice had been reported. Carah standing in front of one of Titanic’s tender ships. It was this ship, “Nomadic” that ferried Molly Brown onto the Titanic in France. It is recently restored, and is the last White Star ship in existence. As we got to the city center, it was starting to rain, so we found a place to sit, and had some dinner. From our vantage point, we could see the city hall out the window, and we could watch people heading for shelter as the sun was setting, another day coming to a close.